On Tuesday July 10 Täby racecourse in Stockholm, Sweden, will host the HH Sheikh Zayed Bin Sultan Al Nahyan run over a mile and the HH Sheikha Fatima Bint Mubarak World Cup for lady riders over a sharp 6 F.
Thanks to the Al Nahyan family’s generous sponsoring of Arabian horse racing worldwide the races carry a hefty purse, the like of which has never before occurred in Scandinavian Arabian racing. The races have created quite a buzz in Scandinavian racing even outside the Arabian horse fraternity and has been mentioned in very positive words on racing television. Both races will see 12 horses at the gate and Sheikh Mansoor Bin Zayed Al Nahyan will be racing Rasikh with a very good chance in the mile race, as the horse is the highest rated in the field. The race will be the second leg in the nationwide Pick 6, which in itself is a sign of the acceptance Arabian racing has received during the last few years. Sponsorships apart, racing in Scandinavia depends on the punters as a certain percentage of the turnover goes back into racing from the Tote and the betting corporation ATG. It pays not only for the prize money, but also for the keep of the courses and veterinary stations. As there are relatively few top performers in Scandinavia, handicaps are increasingly popular both with punters, trainers and owners as they give even the bread-and-butter horses a chance to earn towards their oats. Good handicap racing, however, demands good handicapping and Scandinavia is blessed with Pam Cordrey. Sitting in at the IFAHR Handicappers’ Committee, currently working on an international rating system, Madame Handicapper has a keen eye and a solid knowledge of racing and horses. She is not often proved wrong and is responsible for many a multiple photo finish. The old warrior W Helge paid no heed to that fact in the Polytuft Trophy, a handicap over 1730 m (app. 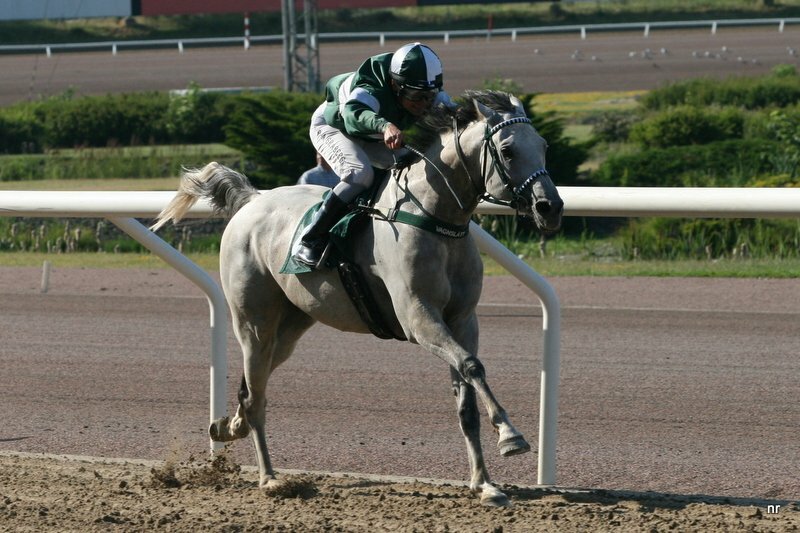 1 mile-half-a-furlong) run at Jägersro this Saturday, when he won by an amazing 8 lengths. Settled in his own ways, he’s not always to be trusted, but when he’s being in earnest racing mood, he can go a mean gallop. With his regular rider on the stable’s other entry, Helge had a champion jockey in the saddle and was in due course made favorite. He broke smartly and soon set the pace along with the confirmed front runner El Quattro. The pair had split the field and opened up a commanding lead going into the last bend and in the straight Helge powered on leaving second place to El Quattro five lengths in front of Sanovagun, who made a promising come-back. Horse-of-the-Year 2011 Joshua Brown came with a good late run to finish half a length behind Sanovagan with the ever improving LL Donner a similar distance away in fifth place.